The Egyptian Football Association (EFA) said on Tuesday it fully supports Ahly after the Red Devils voiced concerns over the sanctions imposed on them by the African governing body ahead of the anticipated Champions League final. Ahly will miss key striker Walid Azaro in Friday's final away to Tunisia's Esperance after he was given a two-match suspension by CAF, which did not disclose any reasons for the sanction in a statement it released late on Monday. However, Azaro was apparently punished after he was caught on cameras ripping off his shirt to deceive referee Mehdi Abid Charef into thinking he was tugged and pushed by an opponent, right before the Algerian official pointed to the spot to award Ahly a controversial penalty. Ahly were also fined $20,000 and French coach Patrice Carteron was summoned to a hearing before CAF's disciplinary committee "regarding allegations of unsporting behavior". "The Egyptian Football Association announces its full support for Ahly's demands regarding the sanctions imposed by CAF's disciplinary committee," the EFA said in a statement, saying it had sent a letter to CAF in this regard. 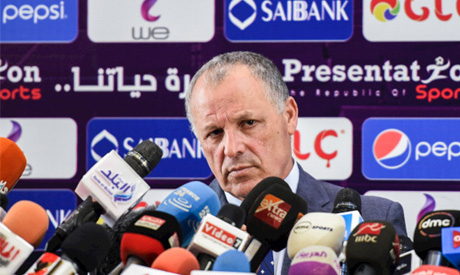 "We fully support Ahly's demand that CAF reconsiders the sanctions … and the EFA has stressed in its letter its full confidence that CAF always seeks to uphold the principles of justice and the spirit of sport." Azaro won two dubious penalties, which Charef still awarded after consulting the Video Assistant Referee (VAR), as Ahly claimed a 3-1 first-leg advantage to close on a record-extending ninth Champions League triumph. The second leg takes place in Rades, Tunis on Friday.